english name "Narrow-Spored Destroying Angel"
1. Amanita virosiformis, N of Frisco, Hatteras Isl., Dare Co., North Carolina, U.S.A.
intro double click in markup mode to edit. 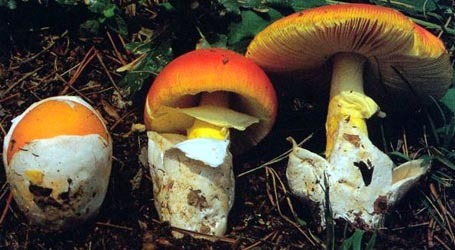 cap The cap of Amanita virosiformis is 27 - 80 mm wide, slightly viscid, smooth, glabrous, shining when dry, white, becoming yellowish in the center with age or drying, with a nonstriate margin. Volval material is absent or may be present as one or two small, membranous patches in the center of the cap. The flesh is thin, fragile, and unchanging. The gills are just free to narrowly adnexed, close, narrow, white, unchanging, and with edges fimbriate. The stem is up to 40 - 90 × 3 - 15 mm, cylindric or narrowing upward, white, unchanging, pruinose above, glabrous and shining below. The bulb is narrowly ellipsoid to ellipsoid to subglobose to globose(? ), white, large, 10 - 25 mm wide and up to 25 mm high. The volva limbate is large, membranous, white, persistent, sheathing lower stem 3 - 15 mm high, with a ragged margin. The ring is varying according to cap diameter, white, membranous, thin, superior to subapical. odor/taste Odor sometimes lacking or, often, suggesting "chloride of lime." Odor slightly of carrion in age or when drying. This species is deadly POISONOUS. The spores measure (9.5-) 10.2 - 13.8 (-16.0) x (3.8-) 4.2 - 5.8 (-6.5) µm and are elongate to cylindric, infrequently baciliform and amyloid. Clamps are absent at bases of basidia. 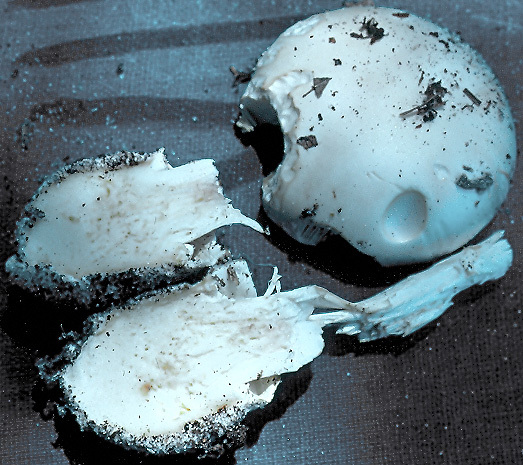 Amanita virosiformis is deadly POISONOUS. Both A. virosiformis and A. tenuifolia were originally described from Florida. The present species is known from eastern Texas and coastal North Carolina; it probably occurs in the sandy coastal plain areas of the US states along the Gulf of Mexico as well as in the similar coastal plain of the southern Atlantic coastal states of the US. This species is found near pine and oak and is solitary to gregarious. The two names on this page are treated as synonyms. A. virosiformis has historic precedence and is thus the name to be accepted. The original descriptions of the two species combined with type studies of both indicate that the only possible difference involves odor. However, the phrase chloride of lime is used to describe the odor of decaying protein associated with an outdoor toilet and the odor of carrion is simply another way of describing the odor of decaying protein. The odor of chloride of lime is not always present in the early stages of development of taxa in which it develops at or after maturity. author (Murrill) Murrill. 1941. Mycologia 33: 448. ≡Venenarius virosiformis Murrill. 1941. Mycologia 33: 436. =Venenarius tenuifolius Murrill. 1945a. Mycologia 37: 270. ≡Amanita tenuifolia (Murrill) Murrill. 1945a. Mycologia 37: 271.
type studies Jenkins. 1979. Mycotaxon 10: 194 (A. tenuifolia), 197 (A. virosiformis). The following material not directly from the protolog of the present taxon and not cited as the work of another researcher is based on original research by R. E. Tulloss. from type study of Jenkins (1979): [-/-/1] 11.7 - 13.3 × 3.9 - 4.7 μm, (Q = 2.49 - 3.41; Q' = 2.71), hyaline, thin-walled, amyloid, cylindric to bacilliform, often adaxially flattened; apiculus sublateral, very short, cylindric; contents guttulate; color in deposit not recorded. from type study of Venenarius tenuifolius by Jenkins (1979): [-/-/1] 11.7 - 12.5 (-13.6) × 4.3 - 4.7 μm, (Q = 2.49 - 2.89; Q' = 2.63), hyaline, thin-walled, amyloid, cylindric, often adaxially flattened; apiculus sublateral, short, cylindric; contents guttulate; color in deposit not recorded. from partial type study of RET: [40/1/1] (9.5-) 10.5 - 13.2 (-15.0) × 4.0 - 5.0 (-5.5) μm, (L = 11.9 μm; W = 4.6 μm; Q = (2.08-) 2.33 - 3.10 (-3.20); Q = 2.63), hyaline, colorless, smooth, thin-walled, amyloid, cylindric to bacilliform; apiculus sublateral, cylindric, proportionately small; contents granular to guttulate; color in deposit not recorded. from partial type study of Venenarius tenuifolius of RET: [66/4/1] (9.8-) 10.0 - 14.0 (-15.0) × (3.8-) 4.2 - 6.0 (-6.2) μm, (L = 11.2 - 12.3 μm; L' = 11.8 μm; W = 4.4 - 5.5 μm; W' = 4.8 μm; Q = (1.74-) 1.88 - 3.29 (-3.62); Q = 2.25 - 2.76; Q' = 2.47), hyaline, colorless, smooth, thin-walled, amyloid, rarely densely decorated with fine amyloid warts, cylindric to bacilliform, infrequently elongate; apiculus ?? ; contents granular; color in deposit not recorded. 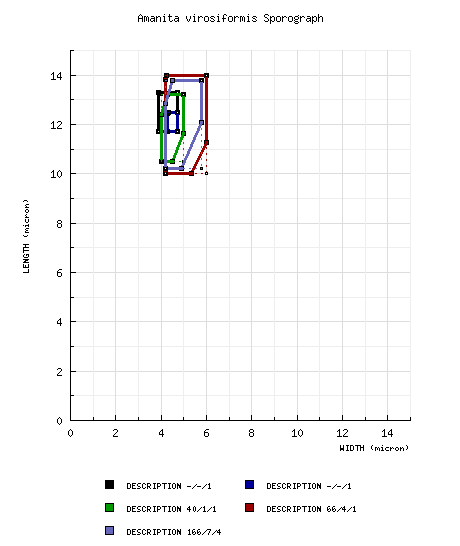 composite of data from all material revised by RET: [166/7/4] (9.5-) 10.2 - 13.8 (-16.0) × (3.8-) 4.2 - 5.8 (-6.5) μm, (L = 11.2 - 12.3 μm; L' = 11.9 μm; W = 4.4 - 5.5 μm; W' = 4.8 μm; Q = (1.74-) 2.08 - 3.06 (-3.62); Q = 2.25 - 2.76; Q' = 2.50), hyaline, colorless, smooth, thin-walled, amyloid, cylindric, infrequently elongate, occasionally bacilliform, sometimes slightly constricted, sometimes slight expanded at one end; apiculus sublateral, cylindric, proportionately small; contents granular; ?? in deposit. ecology Florida: Solitary to subgregarious. Under Quercus laurifolia or in high hammock. [Note: In Florida, the term "hammock" refers to a raised area often including Quercus dryer than the surrounding area. material examined from type study of Jenkins (1979): U. S. A.: FLORIDA— Alachua Co. - Gainesville, 26.v.1938 W. A. Murrill F 16229 (holotype, FLAS). from type study of Amanita tenuifolia by Jenkins (1979): U. S. A.: FLORIDA— Alachua Co. - Gainesville, 22.vi.1944 W. A. Murrill F 38002 (holotype, FLAS). RET: U.S.A.: FLORIDA—Alachua Co. - Burnett's Lk., 24.ix.1941 W. A. Murrill F 18468 (FLAS); Gainesville, 26.v.1938 W. A. Murrill F 16229 (holotype of V. virosiformis, FLAS), 22.vi.1944 W. A. Murrill F 38002 (holotype of V. tenuifolia, FLAS), 1.x.1944 W. A. Murrill s.n. (NYS). Charlotte Co. - unkn. loc., 14.v.1997 Bruce Kuechmann s.n. (RET 259-10). NORTH CAROLINA—Dare Co. - Hatteras Isl., N. of Frisco, Leland prop., 15.vii.1981 Mark H. & R. E. Tulloss 7-15-81-A (RET 168-10). TEXAS—Unkn. Co. - unkn. loc., 10.vi.2000 NAMA2000 participant s.n. [Tulloss 6-10-00-B] (F, NAMA2000 voucher 189). photo RET - (1) north of Frisco, Hatteras Island, Dare County, North Carolina, U.S.A.
select a collection to review/add spore measurements..#787480. W. A. Murrill, #F 16229, U.S.A., FLORIDA, Alachua Co., Gainesville#787481. W. A. Murrill, #F 38002, U.S.A., FLORIDA, Alachua Co., Gainesville#787482. W. A. Murrill, #F 18468, U.S.A., FLORIDA, Alachua Co., Burnett's Lake#787483. W. A. Murrill, #F 16229, U.S.A., FLORIDA, Alachua Co., Gainesville#787484. W. A. Murrill, #F 38002, U.S.A., FLORIDA, Alachua Co., Gainesville#787485. Bruce Kuechmann, #s.n., U.S.A., FLORIDA, Charlotte Co., unkn. loc.#787486. Mark H. & R. E. Tulloss, #7-15-81-A, U.S.A., NORTH CAROLINA, Dare Co., ..#787487. NAMA2000 participant, #s.n.=>Tulloss 6-10-00-B, U.S.A., TEXAS, Unkn. Co..